PALM BEACH, Fla. — Speakers at the National Association of Chain Drug Stores Annual Meeting here last month argued that retailers need to respond to new consumer priorities and competitive pressures by embracing change while preserving and building on their traditional strengths. Mark Panzer, senior vice president of pharmacy, health and wellness at Albertsons Cos., stated that retailers must react quickly as consumer needs change, particularly in e-commerce. But he added that the personal connection with consumers remains critical. Alex Gourlay passes NACDS’ chairman’s gavel to Mark Panzer. 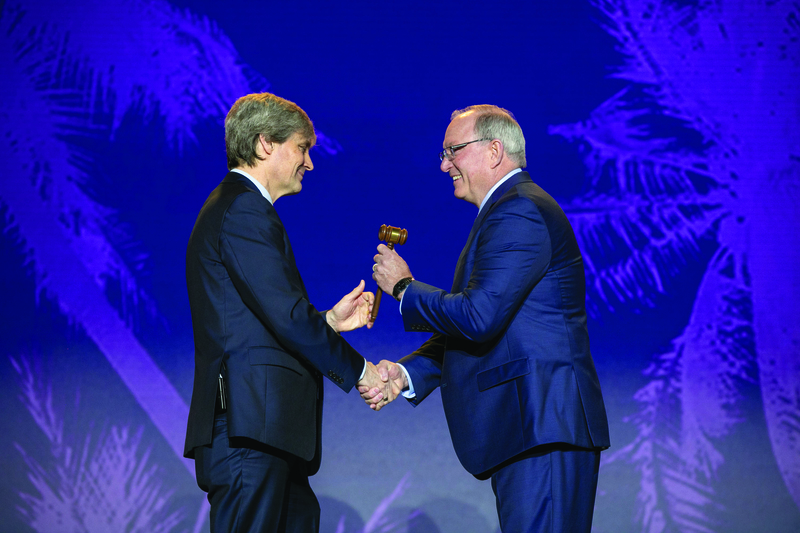 Change was also a major theme in the remarks of outgoing NACDS chairman Alex Gourlay, co-chief operating officer of Walgreens Boots Alliance and president of Walgreens. Gourlay emphasized the need for a customer-first approach during his year as chairman, and he pointed to the importance of offering consumers the price transparency they deserve and the convenience they desire. “Redefining convenience has always been at the heart of the pharmacy model,” Gourlay said, noting that the industry is well positioned to deliver on that promise, given that 90% of American consumers live within five miles of a pharmacy. Another opportunity for the industry involves building trust by emphasizing community engagement and corporate social responsibility. To that end Gourlay launched NACDS’ “2017 Chain Pharmacy Community Engagement Report,” which detailed NACDS chain members’ community engagement efforts in 2017, including the contribution of an aggregated $630 million and 1.5 million volunteer hours to various causes. The report also described the three biggest areas of focus for NACDS members in 2017: access to affordable medicines and vaccines; preventing diabetes and promoting healthy meals; and preventing opioid abuse. NACDS president and chief executive officer Steve Anderson noted that change is a critical priority for the association as it marks its 85th anniversary. Providing a road map for that transformation is NACDS’ Future Value Targeting initiative, which Anderson said is committed to returning value to chains and suppliers now and in the future. Anderson added that issues related to that Access Agenda include: direct and indirect remuneration fee reform; preventing unlawful Medicaid reimbursement policies; battling limits on pharmacy choice for military families and veterans; improving state vaccination policies; working for point-of-care testing for flu and strep; continuing to serve as part of the solution on the opioid abuse epidemic; and advancing other public health issues. Panzer endorsed the Access Agenda, noting that NACDS’ efforts reflect the ultimate goal of pharmacy and of retail, which is to serve the patient and the customer. Panzer also cited the efforts of the NACDS Retail Advisory Board, whose members mainly represent stores’ front-end ­business. That too is a critical part of the business of NACDS’ members. “It’s vital to concentrate not just on our pharmacy business but also on building a healthy front-end business to remain a relevant and profitable business model,” Panzer said.